I called this latest creation of ours in the southern courtyard of our farmhouse in Herzfelde a “Daoist” sculpture, because it is, as the carved Chinese characters says, “Daofa Ziran” 道法自然 -“the Way (the Dao) is to be natural and self-thus”, which expresses the Daoist philosophy and what we tried to do succinctly. The timber columns are more than 230 years, they were taken from the old timber/mud framework of our farmhouse when we transformed the “longhouse” (the German name “Zur Langer Reihe” actually means (a house) along a long road) into four individual units, two as a holiday flat, one for permanent rental and one for ourselves. In the sculpture we made no alterations to the re-cycled columns and allowed them to be themselves, full of pot-marks of time as they were taken off the house. The only human intervention after selection is the carving of the Chinese characters written by a famous calligrapher from Lijiang and painted red. The other minor bit of “decoration” we did was to slot some copper pieces between the cracks in the old timber in two of the taller columns, this is to highlight the “cracks” often happened in nature and in our lives and when the beat-up copper gets oxidized, green “tears’ will run down these cracks. These four pieces of timber use to hold up a house, now they became “four fingers holding up heaven” to express what we tried to do – transforming the mundane to the sacred in our creative act. We made something new by selecting and highlighting what are already there in the ‘benxing” 本性 (the original character) of the materials as found and lightly touched them as we should, if we were to approach our art of making from a Daoist point of view. Sadly, being “qingdan” 清淡 (simple and elegant) by eliminating the superfluous is something we have forgotten in our modern age and we hope to re-establish this simple Daoist approach in our latest sculpture by doing the minimal to what is already existing. Hope you like it and come and visit us one day (http://www.zur-langen-reihe.de/). Thanks Tadeusz, Michal and our in-house carpenter for the efforts. 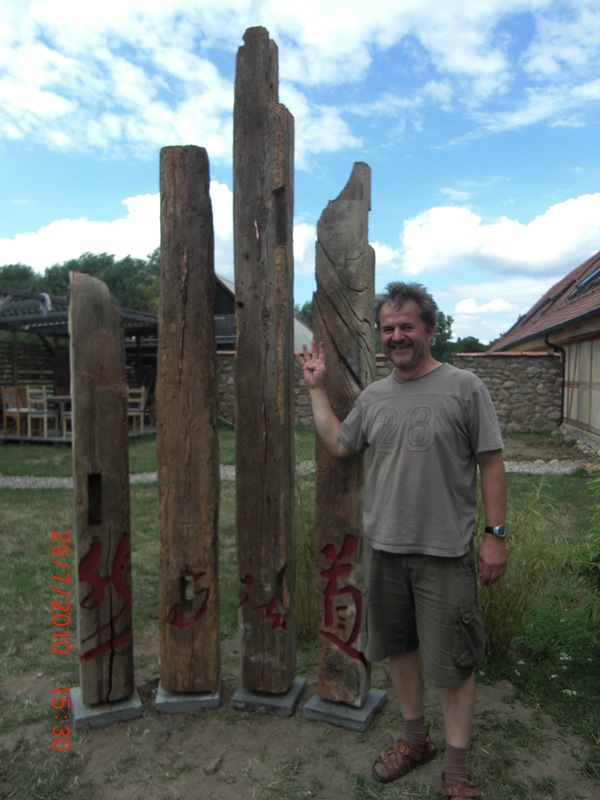 Tadeusz, our Polish artist who did most of the work on the sculpture. Tags: Daoist aesthetics, Daoist philosophy, Taoist sculpture, Zur Langen Reihe.